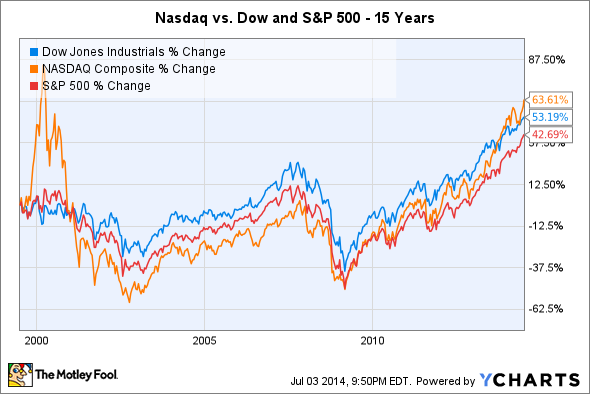 Will the Nasdaq Ever Match the Dow's All-Time Highs? Investors have waited a long time for the tech-heavy Nasdaq to catch up. The Dow Jones Industrials (DJINDICES:^DJI) set another all-time record high Thursday, and over the past year and a half or so the Dow has set new record levels more than five dozen times. Meanwhile, though, investors in the Nasdaq Composite (NASDAQINDEX:^IXIC) still have a long way to go before they can hope to see new heights for the tech-heavy index, which still remains more than 10% below its own high-water mark from 2000. What will it take for the Nasdaq to catch up with the Dow and start setting records of its own? Let's take a closer look. It's easy to conclude that the Nasdaq must have underperformed the Dow, the S&P 500 (SNPINDEX:^GSPC), and other large-cap stock market benchmarks over the long run because of its inability to reach new records after the bursting of the tech bubble in the early 2000s. Yet as you can see below, unless you measure the Nasdaq's performance exactly from the top of the 1990s bull market, the Nasdaq has still outdone its rival indexes. Long after the end of the 1990s boom, how tech stocks perform still makes or breaks the Nasdaq's overall performance. Tech stocks make up more than 40% of the weighting of the Nasdaq Composite, more than double the next-highest sector's weight. Even with thousands of stocks making up the Nasdaq Composite, the largest companies in the index still have an inordinate impact on how it moves. Apple (NASDAQ:AAPL) makes up almost 9% of the Nasdaq's weight, and so its stellar performance over the past year in bouncing back from a big correction in 2012 and early 2013 has helped the Nasdaq advance substantially. Hopes for wearable technology and new innovations for its line of existing mobile device continue to drive excitement in Apple stock. Microsoft (NASDAQ:MSFT), meanwhile, carries more than a 5% weighting, and it too has seen its shares perform well as investors start to believe that with new leadership, the tech giant can revamp itself as a mobile- and cloud-savvy player in the tech industry. Yet other sectors have also played a big role in the Nasdaq's recovery. Biotech companies have grabbed the spotlight recently, with huge gains in 2013 providing positive momentum this year as well, even though the sector went through a deep correction during the spring. With so much potential for blockbuster growth, the right biotech stocks could help drive the Nasdaq higher as well, and some traders will see the approach of record levels for the Nasdaq as a magnet pulling the index higher. The Nasdaq Composite hasn't gotten as much attention as the Dow or S&P 500, simply because it hasn't been able to exceed its past success from the turn of the millennium. If the rise in interest in technology stocks can run just a little longer, though, record highs for the Nasdaq Composite could easy be within reach before the stock market pauses for a long-awaited break in the five-year-old bull market.